No sooner had it started than it ended. After three 90-minute episodes, the Steven Moffat/Mark Gatiss update of Sherlock Holmes has already reached the end of its initial run. With ratings and reviews confirming the series’ success with both viewers and critics, it was never a question of if the BBC would commission a second series, but when and how many. For now, here’s a look back on the modernisation of this most Victorian of characters. Recently invalided army doctor John Watson is introduced to the enigmatic Sherlock Holmes, the world’s only consulting detective, just as Holmes is called in by the police to help solve a series of seemingly impossible suicides involving a poison pill. Holmes eventually tracks down the killer, a dying cabbie named Jeff, who engages him in a deadly game of chance. However, before the battle of wits is resolved, Watson shoots Jeff dead. As I said in my review, this was a stylish and assured update of the Holmes origin story A Study in Scarlet, introducing us to the main characters while rolling along at a cracking pace, and setting a distinct visual story-telling template. It took several key elements of the original story and faithfully spun them into a 21st-century context, but without being hamstrung by it. (Thankfully, the second half of Scarlet, a painfully slow unravelling of the killer’s motivation, is compressed and reworked into the chilling and far more effective face-to-face confrontation between Sherlock and Jeff.) And Benedict Cumberbatch and Martin Freeman as Holmes and Watson are both convincing individually and engaging as a pair. Holmes is hired by an old friend to look into an unexplained break-in and spray-painted graffiti at a merchant bank. He deduces that the graffiti is a cipher intended for a specific trader at the bank, who is subsequently found murdered in his flat. A journalist is found dead in his apartment the next day, accompanied by the same coded message. Holmes and Watson soon uncover a ring smuggling valuable artefacts out of China for sale in the West, and that one of the two dead men had stolen a multi-million pound jade pin on their travels. Holmes cracks the cipher just in time to help rescue Watson (whom the smugglers have mistaken for Holmes) and his date Sarah. Although this was a good, action-packed yarn, it was also the weakest of the three episodes, and the one occasion on which Sherlock veered towards a more formulaic detective drama – for long stretches it could just have easily been an episode of Lewis. There are flashes of Holmes’ deductive brilliance throughout, but these often feel secondary to the overall plot, serving to move the viewer from one setpiece to another, rather than being the core of the story itself. The trail of breadcrumbs that leads the smugglers to mistake Watson for Holmes was a clever device, but felt implausible – surely a ring that well organised who knew of the existence of Holmes would also know what he looked like? Anyhow, this was a decent story by the standards of a procedural crime series, but it was no more than a workmanlike Sherlock for me. Mycroft Holmes asks his brother Sherlock to investigate the mysterious death of an MI6 employee linked to the disappearance of top-secret military plans. But Sherlock is soon distracted by a series of crimes which he must solve in a prescribed time limit before innocent hostages strapped into bombers’ vests are blown up. Holmes’ successful deductions eventually lead him to his first face-to-face confrontation with nemesis Jim Moriarty, which ends with Sherlock pointing Watson’s gun at a bomber’s vest positioned between himself and Moriarty. The closing instalment of the season was a welcome return to the form of the opening episode, with Sherlock dispensing his deductive skill in rapid-fire fashion as he solves case after case (many referencing a number of the original Holmes short stories, most explicitly The Bruce-Partington Plans). Cumberbatch plays Holmes’ self-confessed sociopathic tendencies perfectly as he tackles Moriarty’s conundrums with glee, treating the innocent pawns in the game with casual and coldly rational disdain. His reaction to the explosion which kills the blind old woman (and 11 others) – “but I solved the case!” – before immediately reeling off on another whirlwind of deductive reasoning reveals both the inner child within the man and the child-like excitement of returning to the game, and Cumberbatch’s performance is utterly believable without being unsympathetic. In fact, as we discover, the lives of Moriarty and Holmes have been intertwined since childhood, with the former’s first murder being the case which ignited Sherlock’s boyhood interest in criminal investigation. Perhaps more explicitly than any of the books and adaptations have ever done, it is emphasised here that Moriarty is the yin to Holmes’ yang. Both are sociopathic geniuses disillusioned with the boredom of ordinary life, but whereas Holmes uses his particular skills to help solve crime, Moriarty has chosen to assist others to commit them as the world’s only consulting criminal. In the same way that Holmes fails to express concern for the potential or actual bomb victims (because to do so does nothing to help him solve the puzzles), Moriarty is equally dismissive about his victims having, as a boy, killed another “because he annoyed me” and blowing up the blind woman for simply ignoring her script. Holmes and Moriarty are flip sides of the same coin: you can see how each could have easily become the other. It is a compelling theme which has frequently been addressed in the realms of science fiction, perhaps most thoroughly by Star Trek, through the original series episode The Enemy Within and subsequent forays into the mirror universe. The Great Game was an excellent episode, packing an incredible amount of story and character development into 90 short minutes. Sherlock’s ongoing struggle to balance his sociopathy with his need to deal with people is explored more thoroughly here than previously, and he displays a clinical understanding of human emotion – or at least how to manipulate it at the flick of a switch, as in his tearful interrogation of the missing banker’s wife – which makes him even more chilling. Watson’s increasingly confident exchanges with Mycroft show how far he has progressed since A Study in Pink, and his willingness to sacrifice himself at the climax underlined the strength of his relationship with Holmes. Quibbles aside, this was a strong end to what has been an excellent retelling of the Holmes legend, and I cannot wait for the second season which must surely follow. There will be more. We’re having a meeting to talk about how many and when. Steven and Mark are very busy. Steven is obviously doing Doctor Who as well, so it’s just when we’re going to do them. According to BARB, A Study in Pink garnered 8.70m viewers, making it the fifth-most watched show on any channel during that week (beaten only by Eastenders and Coronation Street), and the most-watched show overall on Sunday. The Blind Banker saw a slight dip to 7.74m, still dominating Sunday and the 11th-most watched show overall, and the overnight number for The Great Game (which does not include time-shifted viewing) was an impressive 7.33m (which compares well against a figure of 7.53m for the opening episode). To put these numbers into context, they are slightly higher than the average viewing figures for the most recent season of Doctor Who. Add to that the BBC’s puzzling scheduling of the series during the school holidays – traditionally a ratings graveyard – and this represents an incredibly strong performance, with the high degree of retention of Pink‘s initial audience being of particular note. For me, the decision to go with a 90-minute format was a wise one. The hour-long length of, say, Hustle, would have forced an oversimplification of the stories, and part of the joy of Holmes is the intricate complexity of his deductions. And to split each story into two 45-minute episodes would break the rhythm of the investigation, forcing the need for a cliffhanger ending mid-story rather than the more gradual unfolding of the plot. There are downsides to this approach, though. With only three stories in this introductory season, it is over in a flash and leaves the audience (well, this member of it, at least) starving for more – although it must be said that this is a format which has sometimes worked well for the BBC, as with Sea of Souls. Dramatically, the biggest negative for me has been that the introduction of Moriarty in just the third episode has felt rushed. In the books, Professor Moriarty is a shadowy, never-seen figure whose organisation represents a gathering but nebulous threat to Holmes. 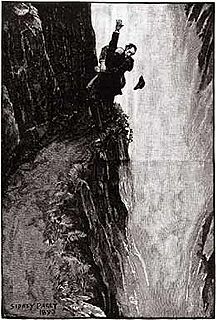 It is not until The Final Problem – the 26th Holmes tale – that the pair finally come face to face, with Holmes’ solution being to throw both himself and Moriarty into the Reichenbach Falls (a scenario which, of course, is neatly alluded to with the final showdown taking place at a swimming pool). In this series, there has been insufficient time to spin Moriarty’s menace out until this final episode suddenly fires a chain of events at us that rapidly establishes him as a combination of Osama Bin-Laden and Jimmy Saville (and what a wonderful gag Sherlock’s Jim’ll Fix It comment was, even though it belies his earlier ignorance of popular culture). Maybe I’m a bit old-fashioned, but I would have preferred the grand unveiling to have taken a little longer than it did, to give time to fully establish Moriarty as a ‘big bad’ genuinely worthy of Holmes. What else? I have liked the gentle repositioning of Watson, who in the books is often little more than a sounding board and diarist. Here Watson, though very much the junior member of the partnership, has proven his worth repeatedly: it is John who stops Jeff in A Study in Pink, who saves Sarah in The Blind Banker and who unselfishly offers to sacrifice himself to save Sherlock in The Great Game. Without Watson, Sherlock is just a great mind; with him, they form a great team. I have also appreciated the seamless use of 21st-century substitutes for their original Holmesian counterparts. Holmes communicates by text message rather than telegram; his use of the homeless community for intelligence on the Golem in the finale echoes the original’s network of urchins, the Baker Street Irregulars; and Holmes and Watson still travel all over London in cabs, albeit now four-wheeled, diesel-powered ones rather than the horse-drawn variety. Above all, there has been more humour in this version of Holmes than in previous incarnations. From pithy one-liners and moments of near-slapstick to the self-knowing references to Watson’s blog, the series’ readiness to lighten the moment adds to the feel that we are joining Holmes and Watson on an Indiana Jones-style adventure rather than a methodical procedural investigation. Sherlock has leapt right up to the top of my list of must-watch TV, and I will eagerly anticipate its (hopefully swift) return. In the interim, I will have to content myself by re-reading the entire Sherlock Holmes canon. A great adaptation makes you want to re-read the originals – and this has been a great adaptation. Congratulations to Messrs Moffat and Gatiss on a job very well done. Posted in Entertainment, Sherlock, TV & film and tagged A Study in Pink, A Study in Scarlet, Andrew Scott, Arthur Conan Doyle, BBC, Benedict Cumberbatch, John Watson, Mark Gatiss, Martin Freeman, Moriarty, Sherlock, Sherlock Holmes, Star Trek, Steven Moffat, The Blind Banker, The Enemy Within, The Great Game, Watson. Bookmark the permalink. Nice analysis of the series. I don’t have too much of an issue with the Moriarty reveal coming in the third episode, I think people would have possibly felt cheated if he hadn’t made an appearance and of course, there was always the (unlikely) chance that the BBC wouldn’t commission a second season. I do think it has been mostly excellent, with the caveats I mentioned in my own post. Certainly thrilled about a second season, but also very aware that this is a show that shouldn’t outstay its welcome. I agree that it makes some sense to introduce Moriarty this season, it was just that story three felt too soon for me. Maybe if it had been episode six of six we would have had a bit more time to build him up, rather than rush him in here. But such is life, and it made for a cracking cliffhanger! I definitely agree that they shouldn’t overdo the show. This is not a series where they should be making thirteen episodes a year, but maybe six would be a nice balance to keep things fresh and viewers happy? This has worked well with Hustle, another series which benefits from only having six-episode runs and is similarly packaged with lots of ‘tourist shots’ of London landmarks to appeal to the international market. And congratulations to you, Tim, on an excellently written review. I’m adding your blog to my list. Sherlock’s ongoing struggle to balance his sociopathy with his need to deal with people is explored more thoroughly here than previously, and he displays a clinical understanding of human emotion – or at least how to manipulate it at the flick of a switch, as in his tearful interrogation of the missing banker’s wife – which makes him even more chilling. I had forgotten the bit with the wife. The way Sherlock deals with people, and how Watson can help him, must be the core of the story, otherwise it becomes – as you said – a formulaic detective story. I hope there’s more of this in the next series. The more I think about it, the closer the parallels are between Sherlock and the Doctor – both brilliant men, both needing a companion to anchor them to humanity, both with ‘evil twin’ nemeses (Moriarty/Master). No wonder Moffat’s in charge of both series! This is a cracking review. I agree that the introduction of Moriarty felt a bit rushed and I felt they left it open to another series rather blatently which I didn’t like. Other than that though, I feel it’s the most impressive series to be shown on these shores for a good while. I’m not sure whether it needed the hour and a half runtime though, in parts I felt it dragged a bit but then you could see this as each episode being a film of sorts. I look forward to the next series and any subsequent reviews you do. I think the second episode was a bit padded, but the first and last ones felt just right at 90 minutes. As I’ve said, I much prefer the 90 minute format to 2×45 because it allows the story to be a bit more organic. But, yes, it’s been as impressive a new show as we have seen in the UK for a while, and it’s been a while since something has exceeded my expectations like Sherlock has. Keep up the good work on your blog – it’s always useful to read a viewer’s opinion on series I haven’t got round to watching but might want to try. I really like the fact that it is the things that people seem to complain about the most (the texts, the cab journeys, the blogging) that are actually the most authentic touches. Thanks! My guess – and it’s only a guess – is that we will not see Sherlock again until Autumn 2011. The spring would be too soon (and would clash with the shooting schedule for Doctor Who), and I don’t think the BBC will waste it on the summer holidays again. It’s a long time to wait, but at least we have the books to fall back on! Maybe familiarity with the books breeds the appreciation of the modernised touches? I positively giggled with delight when I realised Holmes and Watson were still whizzing round London in cabs, and the snatches of dialogue in both the first and last episodes which are lifted verbatim from the stories were a lovely nod to readers of the books without being too overt. I agree that one of the best elements of this version was the way they seamlessly placed Holmes and Watson into the present day, and also the use of familiar elements of the original stories with a modern twist. This is excellent tv and well deserves a second series. Great comprehensive review! You’re actually making me want to read the books now. The tv series worked well w/o requiring too much foreknowledge about Holmes from its viewers, but I can see how much more rewarding being able to point out what elements have been reenvisioned/modernized would be. (I often feel the same way about “Doctor Who,” having never seen much of the show pre-RTD. When others point out subtle references to the old series, I feel like I’m missing out and it makes me want to be in the know). You really hit the nail on the head w/ your assessment of “The Blind Banker” as “formulaic detective drama,” one that “could just have easily been an episode of Lewis.” It did feel like just mere filler, like they hit the pause switch in terms of the story arc of the entire series. Maybe it’s the absence of Lestrade and Mycroft, but it really had to me the quality of being both stand-alone and the odd one out. I much preferred the bookending eps, especially since there was movement again w/ the story arc, and because the two eps felt more interconnected. Great job on this! Blog bookmarked–I look forward to more of your reviews. My own review of “The Great Game”: http://rioliang.wordpress.com/2010/08/09/i-just-watched-sherlock-series-1-ep-3-the-great-game/. Thanks for the comment, Rio. 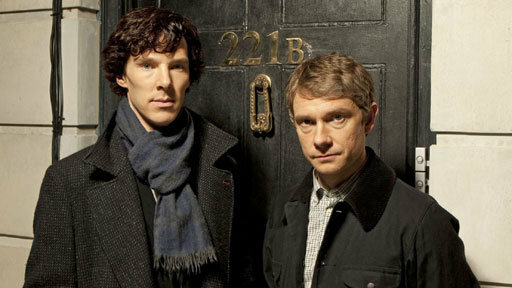 From talking to friends, it does seem the series has worked equally well for both Holmes aficionados and new fans. I’m somewhere between the two with both Holmes and Who – I get some of the references, having read the books years ago, but not all of them. I think you’re right about The Blind Banker being effectively a stand-alone. If it had been (a) a bit better and (b) part of, say, a 13 episode run it would have stood out less. (Indeed, stand-alones often make the best episodes – I’m thinking in particular of Who’s ‘Blink’.) But as one of three it stuck out more. Yes indeed. I see you were also an Ashes To Ashes fan – I was a bit in two minds about the ending, but it was a shame to see the series go. Adding you to my blogroll – I like your style! Secondly: Impressive and excellent review; I read your full-length review of ‘A Study in Pink’, too, it’s brilliant! It will be interesting to see how the Holmes/Moriarty dynamic develops. In the books, Holmes is very much the underdog, but here they seem to be pitched more as equals. Great review, I thought I’d been quite thorough but you pretty much covered everything. I agree with your opinion that the Moriarty card has been played very early considering now they do plan to do more episodes. but I do disagree about the Moriarty casting I thought it was really good, to look at he isn’t much which is actually what made it good for me, I would have hated to see an obvious stage villain. All I can sum it up with is that the guy they picked is just so damn creepy! Thanks for popping by, Jessica. I’m unsure one way or the other about the Moriarty casting (my issue was primarily with how early he was introduced), but we’ll get more of an opportunity to watch this unfold in season two. I think it was certainly important to have someone of a similar age to Sherlock so that we continue to see them as equal-but-opposites, and because otherwise it would have messed up the timeline with young Moriarty’s first murder also being young Sherlock’s first ‘case’. Anyway, given how adroitly Moffat and Gatiss handled this first run, I’m sure they’ll do a grand job with giving us a closer look at Moriarty next season. Brilliant review, I agree with just about everything you say! I quite liked Moriarty, he wasn’t at all what I was expecting, continuing the series’ general trend of interesting, but spot on (for me) casting. I think the introduction of him so early was just another part of the bizarre rushed feel of just having three episodes. Introducing him at the end of episode 3 is too early, but not showing him at all in the first season would have felt like they were drawing it out… maybe raising expectations higher than they could actually deliver. If Moriarty had been introduced in the final episode of a 6-story run, that would certainly have felt less rushed. But I guess they opted for three episodes for a good reason, to ensure the quality stayed high and to keep the audience hungry for more (it certainly worked in that respect). Given that The Blind Banker – the one episode not written by Moffat or Gatiss – was the weakest of the three, I think the decision to restrict it to three episodes was a correct one. Taken in that context, I can live with rushed introduction of Moriarty. Now we will have the fun of seeing how the dynamic between Sherlock and ‘Jim’ unfolds. Wonderful series. Great camera effects and great acting. Why is this (Sherlock PBS 2010) not more than 3 shows? Stephen Moffat needs to make this into an on going Long series. Unfortunately, the BBC have already confirmed that season two will consist of three 90-minute episodes, the same as season one. Moffat’s reluctance to commit to more episodes is understandable (even though I would also love to see more than just three new Sherlocks next year). His “day job” is as executive producer and head writer of Doctor Who, so it is difficult for him to commit to overseeing much more without putting the quality of the show at risk. Also, Martin Freeman has just been cast as Bilbo Baggins in the film version of The Hobbit, which may curtail his availability for Sherlock during 2011. I loved these shows my only critisism was that Oh! I guessed the endings. I guessed that it was a cab driver and I guessed that it was (if not a super nova) something to do with the night sky that was historically incorrect – and that you could find that kind of minor information SO quickly seemed a little implausable. To guess the ending of a Mystery – surely that is unforgivable? No, because the rest is SO good. Nice write up on the series.